on behalf of SPIE and OSA student chapters from the University of Latvia we are pleased to invite you to join us in Riga, Latvia for the 11th International young scientist conference “Developments in Optics and Communications”! The conference will be held on April 8-10, 2015. Here you will have a great opportunity to meet other students and young scientists that work in the research field of optics and photonics, share your ideas and experiences as well as establish contacts for future collaborations. REGISTRATION for the conference is open now. The registration deadline is February 4, 2015. Please note, that the official language of the conference "Developments in Optics and Communications" is English. 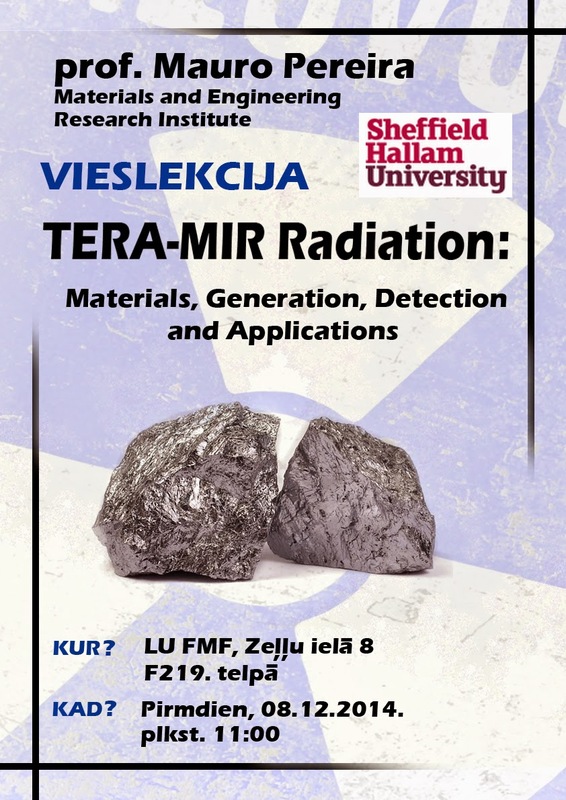 Gaidāma vieslekcija "TERA-MIR radiation: Materials, Generation, Detection and Applications"
2014. gada 8. decembrī Rīgā viesosies profesors Mauro Pereira no Šefīldas Hallam Universitātes (Sheffield Hallam University). Plkst. 11:00 LU Fizikas un matemātikas fakultātē, fizikas korpusa F219. telpā būs iespēja noklausīties viņa sagatavoto lekciju “TERA-MIR radiation: Materials, Generation, Detection and Applications” (angliski).